[Sam] is working on his Interactive Technology Degree and he made some alterations to this guitar as a class project. It doesn’t look much different, but closer inspection will reveal a handful of extra buttons, and a camera module. He actually added a Wii remote to the guitar which is used to control Max/MSP. His pinky is pointing at one of the buttons. That one is red and triggers the Bluetooth sync function for the Wii remote. The other four buttons are wired to the up, down, A, and B buttons. In the video after the break [Sam] talks about the Max/MSP front-end which is used to connect the remote to the computer. Once communications are established the accelerometer sensor data is continuously streamed to the software, and the other four buttons are used for controlling the patches. 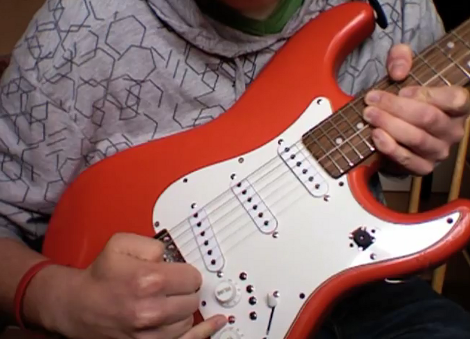 The camera module that is mounted in the guitar can be used to stream video but it appears to have no effect on the sound. In fact, the live video feed can be mixed with a waveform generation. Sound characteristics like volume affect the cross-fade between the two video signals. [Sam] talks about this feature, but when the playing demo starts about 6:10 into the clip we don’t seen any of the live video on the projection screen. It’s a good thing this guy isn’t working on a music degree. That sounded terrible. You would have thought he would have arranged a simple song that shows off the virtues of the new creation instead of just simply wanking about like an idiot. I don’t understand the point of using an accelerometer for input to guitar effects… I never have. I’ve seen a few mods that use them, but it just doesn’t seem practical to me, you have to be able to move around with your guitar freely without worrying about accidentally tweaking parameters. I would much rather have buttons or knobs, but that’s just me. Cool mod though. Even just having the buttons would be cool I think. If I was doing this, I’d hook up the accelerometer outputs to pots instead and tweak stuff that way. The reason for using acceleration data for effect parameters just is not being used here, just a glorified on off stop for each effect. Other than the really bad pitch bend. Something said about a cycle of effects to grind thru to get to the one you need instantly. What do Lissajous figures do here. Live waveforms yeah, but 2 osc’s boo. But I will have to look more at max and pure data.